Flash fiction can open up creativity–in addition to clever, chilling and funny flash, I’ve also read several comments that include word play. Thus a sign that flash creativity is alive and well. According to Writers Digest (.com), “And no matter what you write, stringent word limits can challenge and sharpen your skills in ways that can improve even your long-form work.” The concision of flash is poetry-like and although I’m not a poet, I have found that practicing short form makes my longer prose tighter and full of imagery. You can write any genre in flash which can help you explore a new genre or develop a new idea in a genre you already pursue. Some genres even have organizations that encourage flash, such as the Science Fiction & Fantasy Writers of America, which accepts submissions of flash fiction in 500 to 1,000 words. Even if science fiction is not your genre, the organization accepts different genres and pays $50 for published flash. Something for you to consider. Last week we had a poem in 99 words that deftly interpreted the prompt. Feel free to take such poetic license especially in April as America celebrates, Poetry Month. Scholastic offers resources and links for poets of all ages and levels if you are interested in exploring poetry. One of our regular writers, Paula Moyer, posted an idea for a prompt. That’s the kind of interaction between writers that I’m hoping this weekly challenge will foster. So if you have ideas, too, just let me know! Here is our prompt for the week. April 2, 2014 prompt: In 99 words (no more, no less) write a story that quotes from a song’s lyrics ( could be a classical aria, a rock & roll song, anything). Respond by noon (PST) Tuesday, April 8 to be included in the compilation. My contribution follows and I hope yours does, too! By Charli Mills in Flash Fiction Challenge on April 2, 2014 . Ah, yes. I am familiar with that old song. I always teared up over the words, “we were hungry, just barely alive”. I knew that war was like that for many, way to many people. This will, no doubt, be one of my favorite challenge results to read. lol, I sure wish I had time to write one for you, but even if I jumped in here, I couldn’t keep going week to week. Still, I do love reading what the others write and I can hardly wait to see the results inspired by lyrics. This song always hit me in the heart, too. Then I came to know that my 3rd-great grandfather and his brothers all rode for Stoneman’s cavalry (Union) even though my family lived on the mountain borders of NC/TN (both states that succeeded from the Union). Stoneman’s later raids were brutal in that area because the neighbors who supported the Confederacy had been brutal earlier to the families that supported the Union. These soldiers were all local men, but on two sides of the uniform. My 5th-great Grandfather, James McCanless, was indeed both a teacher and poet although he did not fight in the war of aggression (Civil War). But after the war, 40 families that I’m related to–4 generations of Hatleys, Greens, Hartleys and McCanlesses–left TN. My story is fiction, a mish-mash of facts (including names). I imagined what Virgil Kane might have said had he seen my sad and old grandfather leading his family west out of TN in that wagon train. Thank you for reading. And you are welcome to write once in a while if you can! Un bel di – the words from Puccini’s Madama Butterfly haunted Jean. “Un bel di vedremo” – one fine day he’ll come, the heroine Cio-Cio San sang as she waited by the window, for years, for her beloved to return. And then, one fine day, she got it. “I want to be as little like Cio-Cio San as possible,” she announced. She would stop waiting. Today. She picked up the phone and dialed with a cold hand. When he answered, she said, “It’s over. It has been for awhile. I release you.” He gasped. She laughed. She started her new life. Beautiful flash, Paula! Thank you! Dunno If I have done justice to this piece…. I think you did it justice! I could feel that haunting sadness in your story. Wow, that was powerful. Incredible take on the prompt! Welcome Sarah! Thank you for joining the challenge! Great flash–love the title and how it drums on the tongue. 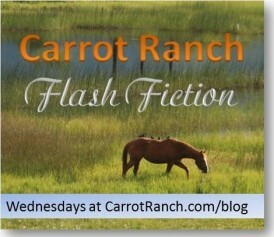 I’ll post your story on Carrot Ranch Communications FB page and include it in the Tuesday compilation. Thank you! Thank you. This was a fun challenge. Difficult to choose just one song but a fantastic prompt. Paula Moyer, one of our weekly “flashers,” came up with the prompt this week. It was hard for me to choose one song, too. I find that by doing weekly flash unrelated to any of my ongoing projects I feel more creative. It also gives me an arsenal of possibilities for submitting to magazines or contests; stories I can expand or themes to explore. And I love having writer-companionship in doing this! “…doing weekly flash unrelated to any of my ongoing projects I feel more creative.” Exactly. It’s a wonderful break from my norm and the challenge takes me out of my comfort zone as a writer. Which I love. Rolling down the highway, like a rocket. Headed to town and leaving a trail of trash flying in our wake. There was no time to put the top up. I turn around to tell my wife to hang in there, her face recoils in pain, her tawny hair swirling in the wind. I grasp the wheel, swerving to miss the oncoming truck. The horn blares, the tires scorch across the yellow lines, leaving tread on the road. I can taste the dessert. The speedometer needle drifts to the right, shoving the fuel needle towards the floor. Miles to go. Glad to have your talents back, Pete! Great pacing in this flash–fast, furious and desperate. You rocked it! I’m joining in again with this one: http://wp.me/p3O5Jj-eo. They’re all looking good again! Thanks!